Enjoy summer's final song with a trip through the charming cities of the American south. We at DMV.ORG are deeply saddened by the devastation wreaked upon the American South by Hurricane Florence. Our hearts go out to the victims—we stand with you and look forward to journeying your beautiful roads once again. The end of the summer may be here, but there’s always time to squeeze in one more road trip before resuming your regular schedule—especially if that journey takes you through the Deep South. The warm and wonderful region is the perfect last stop for summer, with a climate that will keep the season’s heat alive and an exquisite collective menu just begging to be eaten after a few long months of staying in shape for bathing suit season. The area is also rich in history, making your trip the perfect opportunity to brush up on some facts before getting back in the classroom. And if you’re itching for one last good party before the days start getting shorter, there’s nowhere better to indulge in that whim than New Orleans. All told, the trip from Charleston, South Carolina to the Big Easy clocks in at 742 miles, making it a relaxing drive when spread out over the course of a few days. The slower pace is also a perfect reflection of the Southern lifestyle. So if you’re looking for one last getaway, grab your sweet tea and a portable fan, and get deep into the South. 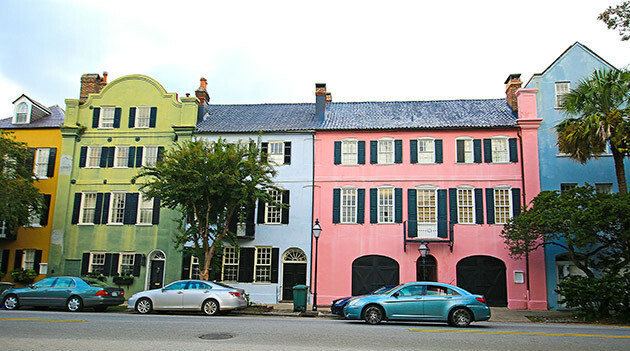 Take a stroll through Charleston's Rainbow Row, a picturesque district of 13 candy-colored homes steeped in southern history. 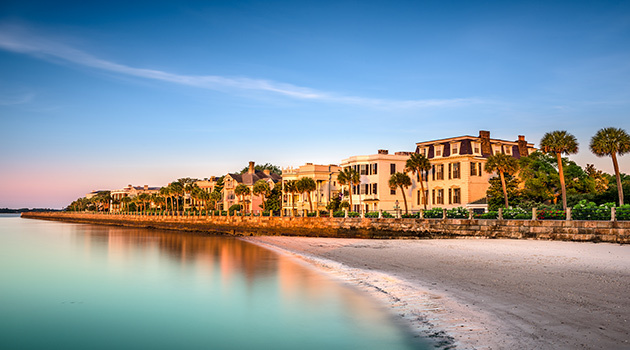 Start your journey in the gorgeous city of Charleston—a burgeoning hotspot for anyone interested in American history, great architecture, or even better food. Get a feel for the town by exploring the Rainbow Row, a cluster of beautiful historic homes downtown that are, as you may have guessed, famous for their multi-hued charms. The historic city market is another chance to see what makes Charleston so unique, with the opportunity to browse local food and crafts. And possibly, if you’re lucky and keep your eyes peeled, the chance to spot Charleston resident Bill Murray. If you’re feeling a little more country, there are a number of beautiful plantations outside of the city center, dating all the way back to the 1600s and complete with their own museums, gardens, and even a zoo. And if you’re more military-minded, you can check out a bevy of retired naval ships at Patriots Point and of course visit Fort Sumter, where the Civil War’s first shots were fired. But it won’t be your last shot to see a town so steeped in historical splendor—or present-day prettiness. The magic and mystery of Forsyth Park is undeniable, with Savannah's signature live oaks draped with Spanish moss everywhere you turn. Just 107 miles south of Charleston along the Interstate 95 corridor is another gem of the region: Savannah. The city is so gorgeous, even the ruthless General William Sherman couldn’t bring himself to burn it as he marched Union troops ever-southward in 1864. The “generous” move has been appreciated by every generation since, allowing the acres of beautiful historic homes to prosper under the delicate veil of Spanish moss and the shade of giant live oak trees, both of which can be found all over the city. 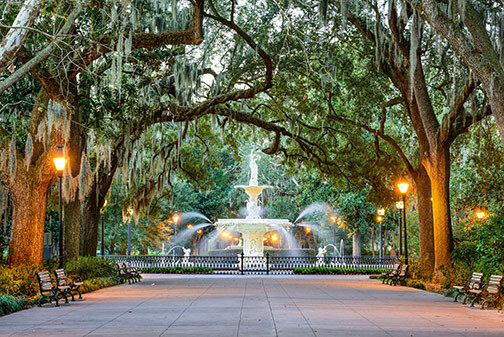 Like many historic towns, the city is organized in squares, most of which include some small park at their center, though Forsyth Park, at the heart of the Historic District, is the biggest and most famous recreation area. Outdoor fun can also be had along the stunning River Street, which follows the Savannah River and offers plenty of places to shop or grab a bite to eat while gazing at the grand steamboats that still run along the water. And if you need to beat the heat, Savannah also has plenty of museums and art exhibits to choose from. The city is home to one of the most prestigious art schools in the country: the Savannah College of Art and Design. The Telfair Museum is the oldest among the galleries—and the oldest art museum in the entire Southeast. But if antebellum isn’t your aesthetic, don’t worry—the road will begin winding toward a new historical era. 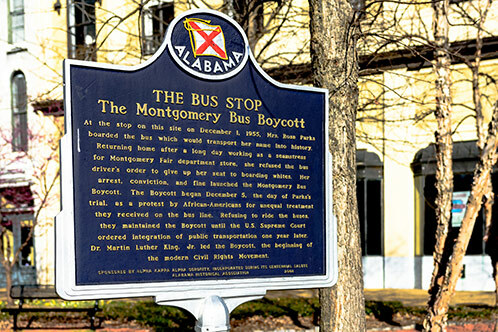 The birth of the Civil Rights movement is memorialized all over Montgomery, such as this homage to the bus stop where Rosa Parks made history. Over the next 333 miles, you’ll travel along Interstate 16, through the always-green and gently rolling hills of the Georgia countryside, and eventually under the wide-open skies of Alabama. Before long, the open space will start to subside, the buildings will get bigger and closer together, and you’ll find yourself in the state capital of Montgomery. The town is a boon for students of modern history, especially those interested in the Civil Rights era. The Rosa Parks Museum, Freedom Rides Museum, and Civil Rights Memorial Center are all great places to reflect on the tragedies and hard-fought triumphs of that turbulent time. And the Dexter Parsonage Museum offers visitors a look at the preserved former home of the Rev. Dr. Martin Luther King, Jr., along with programs to discuss the importance of King’s work. Still, it’s not the only historical era represented by the town. Anyone who appreciates an airplane should check out Wright Brothers Park, where the aviation pioneers opened the nation’s first flight school. Jazz Age aficionados would be loath to miss the F. Scott & Zelda Fitzgerald Museum, situated in the former home of the stylish duo, and music fans in general will be happy to know that the Hank Williams Museum can also be found in town. But these establishments are just the opening notes of an increasingly musical trip. Visit the French Quarter for an eclectic mix of history, culture, and New Orleans-style nightlife. If you’ve had your fill of history and need a study break, get started on the remaining 310 miles of your itinerary—but make sure to leave room for dessert. New Orleans is truly the cherry on top of the trip, allowing you to slide into a vibrant atmosphere steeped in the sounds of hot jazz, the smell of fresh crawfish, and the sights of so many converging cultures, the city had to coin the word “Creole” in order to properly describe itself. 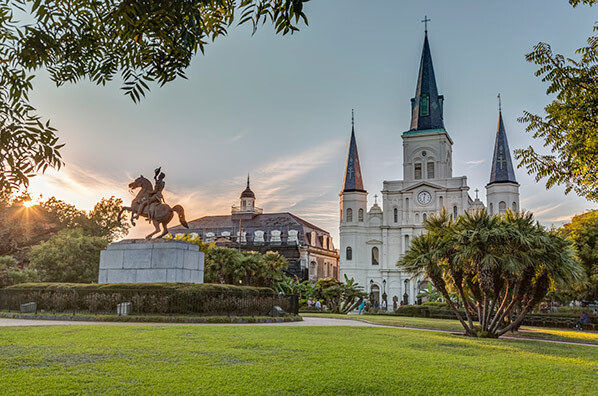 New Orleans truly has something for everyone, whether you’d rather take a daytime stroll to peruse the gorgeous historic architecture of the Garden District or spend all night partying in the hotspots along Bourbon Street. Those looking for all the good nightlife, but less of the tourists, might try Frenchmen Street instead. History buffs have any number of choices, from the Napoleon House to Lafayette Cemetery, while those interested in the darker side of things can visit a somewhat alarming number of purportedly haunted establishments. And lovers of exquisite architecture, delicious food, or exceptional music must merely throw a dart at a map of the city and venture to wherever it lands. However you decide to enjoy the Big Easy, it will be the best place to ease into the coming fall season.